To update and optimise its wastewater disposal system, the authorities of the City of Edmonton in Alberta, Canada, opted to use level measurement technology from Siemens. Installing the Sitrans LUT400 ultrasonic level controller enabled precise measurements, despite adverse ambient conditions such as space restrictions and obstacles impeding the path of the echo beam. Treatment of wastewater in Edmonton requires reliable pumping of the wastewater. Running the pumps dry results in costly repairs and not running pumps can cause flooding and costly environmental clean-up of sewage. 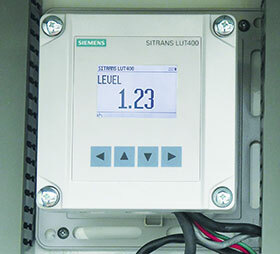 The Siemens Sitrans LUT400 ultrasonic controller is able to run the pumps at the correct times by monitoring the level of wastewater in the wetwells; and the sophisticated auto-false-echo suppression features ensure obstacles in the wetwells are not an issue for measurement. There were a number of aspects which determined the choice of an ultrasonic level controller rather than any other system. For one thing, the measuring devices had to be mounted in extremely cramped conditions and the installers were not necessarily able to place them in the ideal positions. Despite this, the measurement still had to be reliable and precise. Another challenge was that the transducer’s measurement beam intersected a number of different obstacles. However, as Siemens Echomax transducers feature a particularly narrow beam and a function to suppress false echo signals, the solution enabled precise results to be achieved despite the adverse conditions. Biological wastewater treatment using regenerated activated carbon saves disposal costs.